Culture makes people into a nation. The culture in India although diverse and varied, still binds the country together in some form of common identification. The Indian culture, particularly drama and the arts, in spite of having passed through many changes, is characterized by an unmistakable unity and continuity. Though there are diverse languages, religions, traditions, festivals and attire, the rich heritage of the culture survives! Here in this article I am going to discuss some of the various types of Indian Art. To do a complete discussion of Indian Art would require an entire series of books and multiple Phd's so I am not even going to claim that I have covered all there is to know about art in India. Like India Indian paintings are vast, diverse and unique. All periods in the Indian History have painted, be it the cave paintings in Ajanta or paintings by the Mughal artists in Delhi. 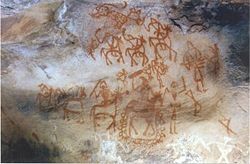 Cave paintings by homo-sapiens in the Rock Shelters of Bhimbetka which have been dated to be over 9,000 years old are the oldest known paintings in India. These paintings depict the lives of the ancient homo-sapeins who lived in these caves. The paintings have been drawn using mainly red and white colors with occasional use of green and yellow colors. They depict scenes from the daily lives of the hunters including scenes of hunting, childbirth, dancing and drinking, religious rites as well as images depicting the natural environment around them. It is amazing that the paints used by these primitive hunters have not faded yet. One of the theories archeologists have is that they used colored earth, vegetable dyes, roots and animal fat to create these paints but a lot of people disagree with the theory. These amazing cave paintings were lost to mankind for a millennia and were unearthed in the 1819 by John Smith, a British officer who accidentally stumbled upon them while on a hunting expedition. There are 34 caves at Ellora and 24 caves at Ajanta. These caves are not natural caves, they were carved by generations of Buddhist, Hindu, and Jain monks. They are probably the finest examples of cave - temple architecture. The paintings in these caves illustrate the story of Buddhism, spanning over a period from 200 BC to 650 AD. The artists and the monks have covered the walls of caves at Ajanta with stunning murals and paintings covering Buddha's life and his teachings. To get the results they have, the artists first filled the pores in the rock by applying mud plaster over the area to be painted. Once this coat was dry a second coat of lime plaster was applied to give them a clear and smooth canvas. On this canvas they first drew the outlines in red ochre and then filled the image with appropriate colors. During the 11th & 12th centuries miniature paintings became popular replacing the wall paintings as the dominant art form. These paintings evolved from the illustrations etched on palm-leaf manuscripts. These manuscripts were mostly contained literature on the Buddhism & Jainism. They also covered the themes from the Ramayana, Mahabharata, Bhagvata Purana, Rasikpriya, Rasamanjiri, etc. In the late 17th century miniature paintings gained lots of recognition and support from the royalty and aristocracy. 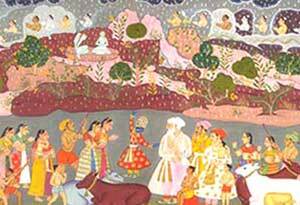 The miniature painting styles from this time can be classified into three schools: The Mugal, The Rajput and Deccan schools. The Mughal Miniature Paintings have a strong and a definite narrative content. They are heavily influenced by the Persian painting style. The paintings use bright colors and bold contrast to show descriptive scenes of the world surrounding the artist. During the reign of Jahangir these paintings gained more sophistication and became smaller and more intricate. The Rajput School was characterized by the Krishna Legends themes. The emphasis was on emotions, especially those of love. These paintings are also known for the depiction of various love acts of the divine couple; Krishna and Radha . In the Deccan School the melding of Persian and Turkish traditions with Indian traditions has created a facinating style of its own. The paintings in this school are boldly executed with lively themes. Ancient India had an international reputation for her brass and bell metal work. The technology of metalworking had been well developed in India by 2500 B.C . This manifested itself in exquisite yet sturdy images and icons in temples and household niches, lamps, platters and other items required for acts of worship, in gold, silver, copper, brass, bronze, and other mixed metals and alloys. 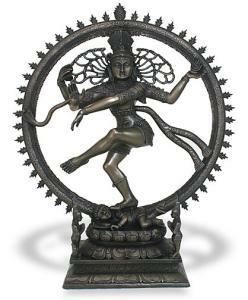 The world-famous dancing figure of Nataraja, a work in the Chola tradition, epitomises this achievement. Villages from Tamil Nadu mould and assemble brass oil-lamps (dipa), standing as well as hanging ones, adorned with decorative swans or women. But what is even more remarkable is that many everyday household equipments in India are art objects. The kitchen ladle, the nut-cracker, the water-pot, are all imbued with the artistic spirit. The water-pot (ghara, kalash, churru) itself can take on myriad forms and shapes and have embossed borders. Benares and Moradabad in Uttar Pradesh are famous for their hand-made or hand-finished brass, copper and even stainless-steel implements of traditional shapes. The blacksmith is traditionally a most important part of the village community. Tribal metalware, for example that of Bastar, Madhya Pradesh, is mainly of iron hammered and twisted into oil lamps. The temple craftmen of Ancient India were famous for their delicate Woodwork. They decorated temples with carved doors and doorposts. Wooden gateways are found in Orissa, Rajasthan, Gujarat and Maharashtra. 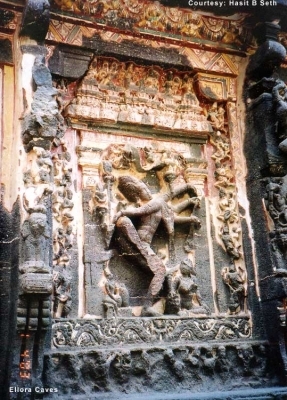 The speciality of Tamil Nadu was the vahana (temple chariot), a massive structure thick with delicate figurines. Andhra Pradesh, Mysore and Karnataka are famous for their elephants and combs, carved mostly out of sandalwood. Many havelis (mansions) of Rajasthan displayed screens, friezes, windows, and canopies of wooden fretwork. Domestic items like the karahi and the khanta too are crafted out of wood. In modern India the woodwork by artists from the state of Jammu & Kashmir is popular throughout the world and the furniture made over here is covered with exquisite carvings. The craftsmen in Kashmir use walnut wood in their creations which makes the handicrafts sturdy, durable and quite expensive. India possessed the knowledge of cotton and fast dye quite early in history compared to other countries. Dyed and patterned cotton cloth from India has been exported internationally from pre-Roman times. A lot of methods are used to enhance the look of fabrics in India. One of them is through embroidery work. Other methods are dyeing and weaving. Karnataka is famous for dyeing and weaving of silk, Rajasthan for the dyeing of cotton with indigo and alazarin. Gujarat and Rajasthan have especially developed bandhni work (tying-and-dying of pinprick patterns on woollen shawls and fine cotton cloth). Block-printing with the help of wooden blocks and vegetable dyes is another speciality of Sanganer, Bagru, Jodhpur, Kota and other centres in Rajasthan. Gujarat and Orissa are renowned for ikat work (a complex process where, before the cloth is woven, the warp or weft threads, or both, are bundled and bound with bands resisting dye-stuffs, and then repeatedly dyed to create bands of patterns). In Gujarat there used to be a thriving centre of silk patola saris of double ikat work in Ahmedabad, Surat, Patan etc. Sambalpur and Cuttack in Orissa, Pochampalli, Chirala and Puttapaka in Andhra Pradesh are still flourishing centres of ikat textiles. Pottery is an important art form in India. Earthen pots have been in usage since the early vedic times for various purposes like: drinking pots, food storage, decorative purposes etc. Over the years most of the regions have developed their own distinct style of pottery that display the makers skill and workmanship. For example The Blue pottery of Jaipur is an art which has been handed down for generations among the potters of this city. The potters over here specialize in blue colored pots and items giving it this name. This pottery is very popular for its delicate design and long life. 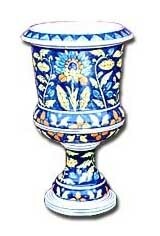 The Image above is an excellent example of The Blue Pottery of Jaipur. Another fine example of the pottery skills developed in India can be seen in the skill of the craftsmen of Khurja(a small town in Uttar Pradesh). They have a distinct style of their own in which they use warm shades of autumnal colors like orange, brown, and light red. The background is often a floral design in sky-blue colour. The pots are often bright in design and can be used as premium tableware or as dinner-sets, jugs, flower vase etc.